Deep drawing processes are used to manufacture high quality parts at a lower cost than comparative processes. Deep drawing requires careful engineering to ensure successful production, with many aspects to consider including advanced technical knowledge, the design and manufacture of tooling and a good understanding of materials' properties. So it's not surprising that from time to time problems arise, and resolution requires thorough analysis to understand the reasons for the failures and how to eliminate them. One particular aspect causing endless problems is the use of inferior material from foreign manufacturing suppliers that doesn't perform as expected. The manufacture of deep drawn products entails the use of specialized tools and dies and forming techniques to achieve high draw ratios that are way in excess of what can be achieved in conventional pressing. 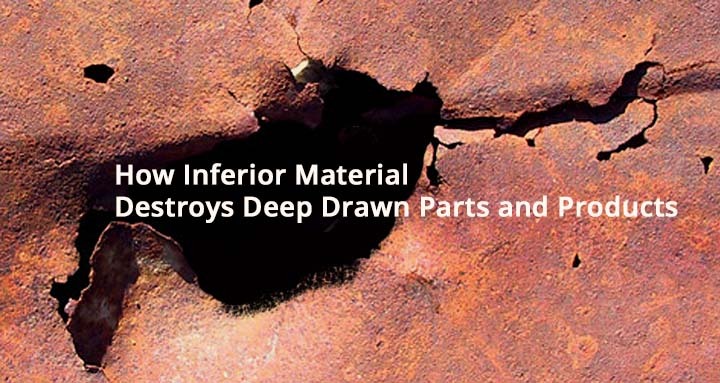 Typical defects that occur are material tearing, wrinkles and the formation of wavy edges. These defects can be controlled by the combination of careful part design and close attention to manufacturing tolerances and processes. Key to this is a full appreciation of the characteristics of the material that is being drawn, and this is usually verified by the material certificate supplied with the material. Because the forming process is designed to utilize material to a particular specification, the use of inferior material that doesn't meet this criterion creates many problems. For example, if there are inclusions in the steel or poor crystalline properties, the material will easily tear or the final part may not have the required wall thickness. Other common reasons for failures, such as tearing and wrinkles, is that the steel does not have the required tensile strength, elongation properties, yield strength or the blanks have varying thicknesses caused by poor control of the rolling and annealing processes. In many instances where inferior material is supplied, buyers have bought on price from foreign manufacturing suppliers and the metal doesn't conform to required specifications. This approach is short sighted leading to high fall-off rates, poor yields and continual production interruptions. Deep drawing of products is a technically demanding process that requires that every aspect is spot-on, especially the material used. The best way to avoid the hassles of high failure rate is to stick with reputable metal suppliers and to deal with deep draw forming manufacturers who have a demonstrated capability to produce quality components.